Do you have armpits? Yes? Then today we have an important tale for you. It’s the story of a self-confessed smelly cosmetic formulator with very sensitive skin who managed to create a deodorant that’s rewriting the natural deodorant rulebook. It’s safe to say that most of us are self-conscious about something. One thing that’s shared by so many of us is the way we smell. It’s a sensitive topic, and a bit taboo, so this one doesn’t come up at the dinner table very often. The way we smell can get you a little (or a lot) worried, and if you’re like our smelly cosmetic formulator your brain might start thinking crazy things like …. Well we don’t want you OR our smelly cosmetic formulator to have to be dealing with these sorts of worries. Maintaining good personal hygiene is very important and deodorants play a big role in keeping body odour in check because they kill the bacteria that cause you to smell. Back in Aaron’s Navy days (erm…. 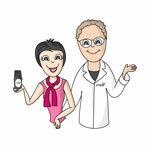 our smelly cosmetic formulator, that is! ), they used the term ‘Hum’. Meaning you stunk so bad that you swore that you could not only smell it but hear it. After 4 hours on a foreign fishing vessel, there was a lot of humming going on. Back in his ‘pre-cosmetic formulator days’, when he was just Smelly Aaron, he always struggled with using deodorants as they caused irritation – usually uncomfortable redness and itchiness. There was only one brand that he could use but it was far from natural. Being very health-obsessed, of course he ditched it and went searching for a natural deodorant. It’s waterless. You might find that sometimes there are little grains of shea butter that need to be rubbed between your fingers to melt before applying. Our beautiful photos have been created by Renee Bell. The post A must read if you have armpits! (and how a natural deodorant changed a life) appeared first on Happy Skincare.